This first Iron Craft project of 2016! For this challenge, we were told to use the gifts associated with a 5th anniversary, wood, silverware and daisies, as our inspiration. 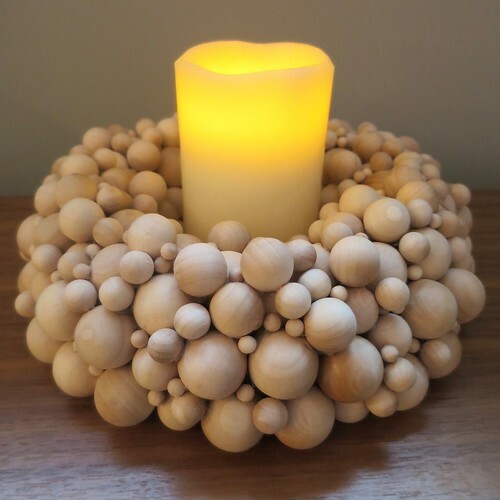 I was pretty sure I was going to use wood and then I remembered a candleholder I pinned on Pinterest made of wooden balls, it was a prefect time to try it. I’m so thrilled with how this turned out. It fits in really well with our modern Scandinavian decor. It was pretty easy to make, but took a lot more wooden balls than I ever thought. Luckily, I had bought 400 of them. Actually, finding the wooden balls was the hardest part. I checked all the local craft shops and they all had wooden beads, but nothing without a hols through it. (Even the employees were surprised.) That led me to the internet. I found the best resource, Craftparts.com. They offered the balls in twenty-once different sizes and grades for a great price. 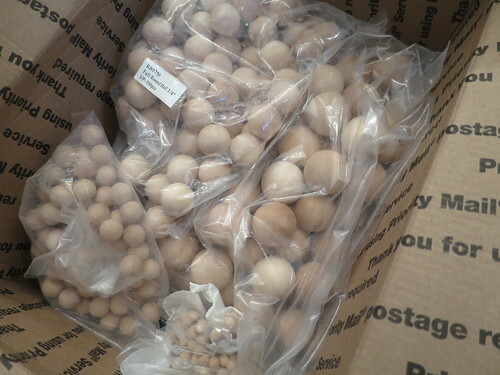 I got the 400 balls and even with shipping it was less than buying 100 of one size elsewhere. Plus I had my package in two days. This is a supply source I will remember. I kept my candleholder very simple. I used first grade balls and didn’t do anything to their finish at all. I really love the wood grain and natural color. You could easily, stain the balls or paint some or all of them. The version that inspired me had bits of greenery inserted in it which was lovely and I’ll remember for next Christmas. 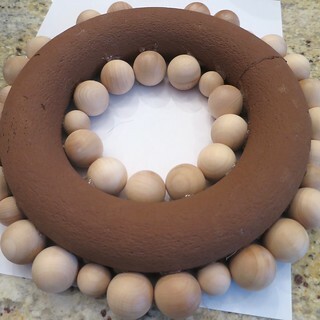 extruded foam wreath form, this harder foam will except paint and not melt from the hot glue. 1. 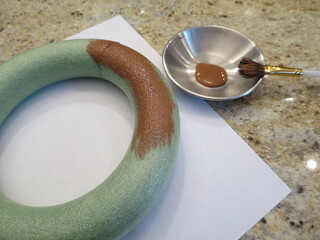 (Optional step) If you are worried that the green of the wreath might show through at all, paint the top and side of it brown. Let dry. 2. Put the wreath on a flat surface. 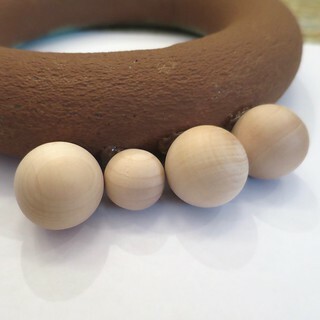 Start gluing wooden balls around the outside bottom edge. 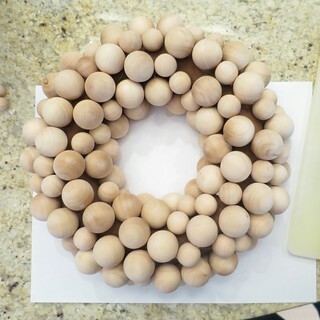 I found it was easiest to put a little glue on the balls and then attach them to the wreath form rather than putting the glue on the wreath. I used a mixed of the 1″ and 3/4″ to to this, but you could as do just the 1″ if you can make it fit correctly all the way around. Do the same thing with the inside bottom edge. 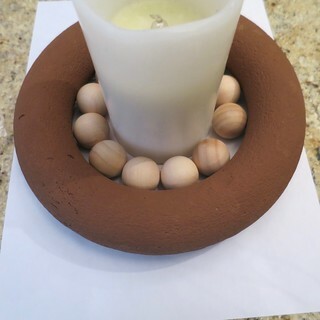 My wreath had just enough space for a pillar candle when I used the 1″ balls. 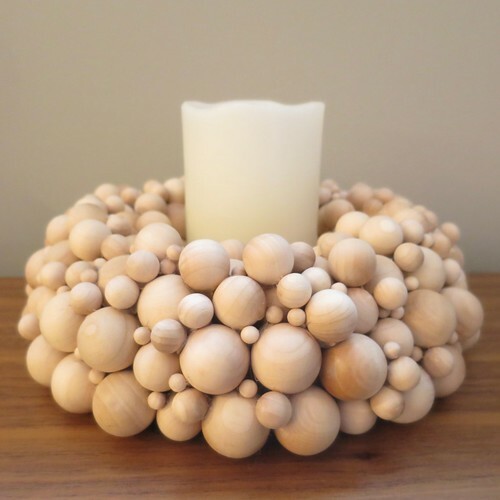 You’ll want to make sure your candle will fit before gluing in the balls as well. 3. Fill in as much of the wreath as you can with the two largest size balls. Don’t worry you will have open spaces that you will fill in later. 4. Start layering in the smaller balls, filling in the open spaces. I added more 3/4″ and 1/2″ then just worked with the 1/2″ and 1/4″. 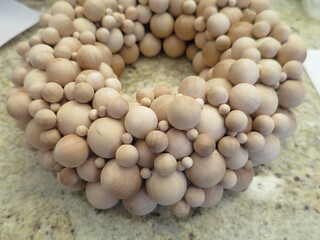 Keep adding balls until you are happy with the shape of the wreath and have filled in any large spaces. 5. Once all the balls are glued securely on, you can use a hairdryer to melt off hot glue strings. 6. 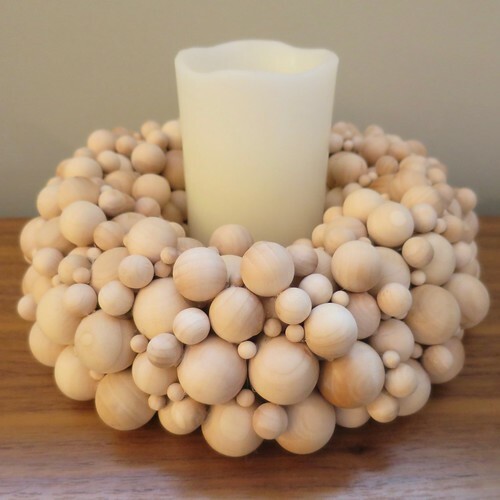 If you want to finish off the bottom and protect surfaces the candleholder may sit on, cut a circle of felt big enough to fit under the wreath yet small enough it doesn’t show. Glue in place. 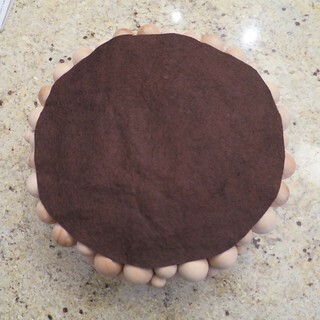 3 years ago by Kat in Challenges , Craft Projects , Crafts , Projects | You can follow any responses to this entry through the RSS feed. You can leave a response, or trackback from your own site. Spectacular! Thanks for sharing your source as well. Do you know what size wreath you used? What a wonderful way to start Iron Craft 2016. I meant to measure it before I started and of course forgot. The center hole was just over 5″, so I would guess it was about 7″ – 8″. Wow! This is really great. So inspiring. Now that is cool. Good job! Thank you! Are you going to Iron Craft with is this year? I love it Kat. Very clever and looks so chic.